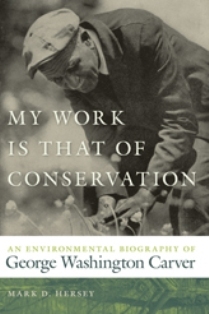 There are several biographies of George Washington Carver in print, but this book, although highly specialized and detailed, would also serve for those who haven’t read one. Hersey, now an assistant professor of history at Mississippi State, was encouraged as an undergraduate at the University of Alabama by professors John Beeler and Rich Megraw. This well-researched study is based on his dissertation. Carver was born in southwest Missouri to a slave named Mary, probably before the Civil War ended, in 1864, although that is not certain. Carver lost both his parents in his infancy. After Emancipation, he was raised by his previous “owners,” Moses and Susan Carver, successful farmers who had owned two of the seventeen slaves in the county and then became foster parents to George and his brother Jim. Mr. Carver hired tutors for George and allowed him to attend a primary school for blacks in nearby Neosho. Later, at twenty-five, George would attend Simpson College and then, most importantly, Iowa Agricultural College in Ames. At both colleges George was the first African American student and had to work hard to pay the bills. In the end he emerged with both a bachelor’s and a master’s degree in biology, an extraordinary accomplishment for the time. Carver was a professionally trained scientist but also a complicated man. He was a skilled artist and a devout Christian and had no problems reconciling Darwin and evolution with his deep faith. For Carver science was truth and Christianity was truth. He never understood the need for the Scopes Trial. For him the natural world in all its beauty and inspiration was perpetual proof of the creation. Hersey’s focus on Carver’s career at Tuskegee is not the story we are familiar with. An eccentric fellow, with no intellectual peer at Tuskegee, Carver was not a popular faculty member. He wore a flower in his lapel each day, ate edible weeds from the countryside if he didn’t like the cafeteria food, and sometimes made his own clothes. As one might guess, he and the principal, Booker T. Washington, had a difficult relationship. Hersey makes some surprising assertions. Carver, known as “The Peanut Man,” “developed virtually no peanut products that were both original and marketable.” He did not even invent peanut butter. Hailed as a consummate agricultural scientist, most of Carver’s career was spent in opposition to agricultural chemistry, that is, chemical fertilizers. Carver believed in improving the soil, building it up with animal manure, compost from the forest, muck from the swamps. Black tenants and sharecroppers could do this with no expense. But, Hersey reminds us, the croppers had no incentive to improve, with great labor, soil they did not own. And the owners wanted only one activity from the tenants: plant, tend, and harvest cotton. Carver urged tenants to keep chickens and livestock, plant vegetable gardens, harvest wild grapes, gather nuts, avoid all waste, stop buying tobacco and whiskey, and save their money. The croppers were themselves resistant to change, and the owners, far from wanting the croppers to save money and come out in the black, would rather have them remain in debt and back again next year.